Two high profile matches on this first day of the quarter finals. With their flu “symptoms” the Germans stepped onto the field to face the French in this juicy first quarter final fixture. The pre-match festivities stared off with the two captains Hugo Lloris and Phillipe Lahm speaking in front of the crowd as part of FIFA’s fight against discrimination campaign. 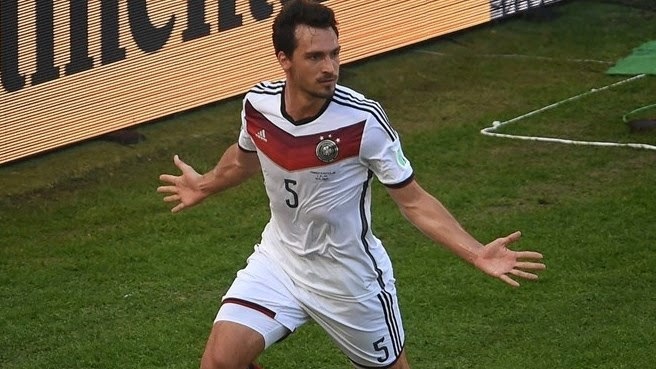 Those said symptoms however did not seem to affect the Germans, who went ahead in just the 12th minute after a free-kick from Kroos found Hummels’s head, and the center-back made no mistake putting it backwards, past French keeper Hugo Lloris. The rest of the initial 25 minutes of the first-half were quite even in terms of possession, but it was Lloris who had more work to do with a few chances inside the French box. Neuer on the other hand did not see the ball much at all. In the 33rd, the first real scoring chance for the French, but Neuer was up to the task making a great reaction save from a Valbuena shot inside the box. The rest of the half took place mostly in the center of the pitch, with the French having a couple more chances, none of which however were dangerous enough to take Germany’s lead away. The French came out of the dressing room with a point to prove, as they had numerous chances in the first 15 minutes. The German defense and Neuer the goalkeeper were ready for all of Les Bleus’ attacks in that time-frame however. In the 69th minute the Germans had a good chance of their own, but Sammy Khedira’s shot from inside the box sailed just wide. The French did not take their foot off the gas pedal as they kept pressing with the match approaching the 80th minute. But the German defense seemed to have all the answers as a number of French possessions inside the German box were swatted away. After a flurry of French attacks the Germans had a break and seemed to have a situation that would surely finish the match off, but Andre Schurrle could not put it past Llori who saved the low shot with his leg. In the very last minute 90th (+4) Karim Benzema received a ball inside the box, but again Neuer put a hand up and made yet another incredible reaction save, a save that proved to be the last action of the match, with the Germans going through to the semi-final. The hosts Brazil went into this match with South American rivals Colombia knowing that anything less than a victory will seem like utter disappointment for the home crowd. The home squad, with the backing of the home fans got off to a flying start, when Thiago Silva got on the end of a corner-kick and put the ball in the back of the net in just the 7th minute. With Brazil searching for a second goal, Colombian keeper Ospina kept his side in it with a good save from an inside the box shot by Hulk in the 19th minute. In the 27th it was Hulk again, with a good shot inside the Colombian box, but it was Ospina again with the impressive save. Brazil were starting to look like the very nation that have won 5 World Cup titles previously, playing a beautiful attacking style of football, something they did not show in their previous four matches. With Colombia looking a lot less impressive than in their previous matches, the two left for the dressing-room with a 1-0 score-line, one that the Colombians must have been content with considering Brazil’s obvious dominating half. 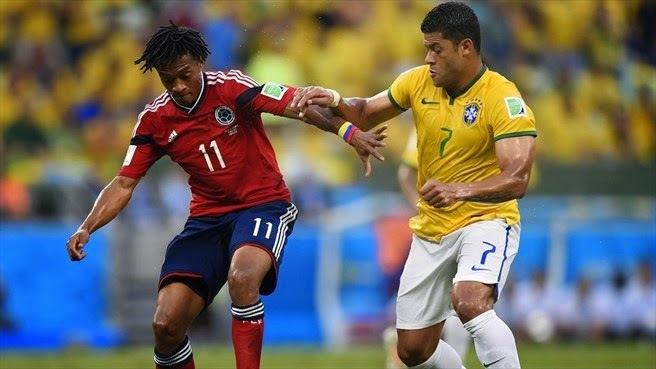 The Colombians looked more confident in the second half, doing a bit more in terms of attacking the Brazilian defense. The match did become a bit choppy, with fouls called against both squad in what seemed at almost every attack. In the 64th minute Colombia did get their goal, unfortunately however, Colombian captain Yepes was judged offside just before he was able to slot the ball in. In the 68th minute it was a moment of magic, when Brazilian defender David Luiz took a free-kick from about 20 yards, putting it into the top-right corner in very impressive fashion. Brazil were now just 22 minutes away from a meeting with the Germans. In the 80th a penalty-kick for the Colombians after Julio Cesar took a Colombian player inside the box, and who else but James Rodriguez slotted the ball in the pull his side back in the match with just about 10 minutes to go. After the goal, Colombia were on the front foot, pushing everything they had forward. But their efforts would prove for nothing, as they were not able to tie the match up, with Brazil advancing to the semi-finals. None of our guys had faith in the hosts, while both Iain and Kon did predict Germany to win. Kon did have the correct scoreline as well.